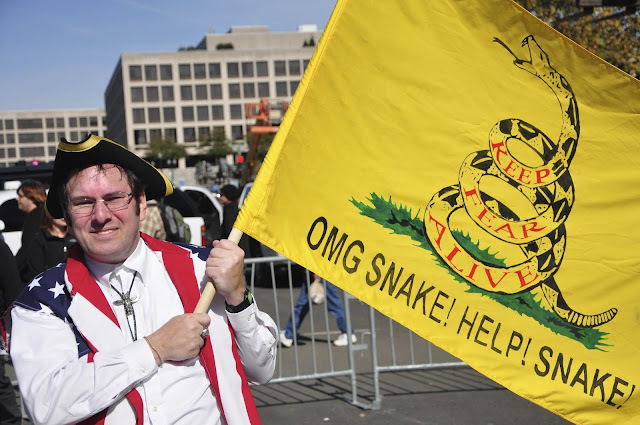 In my live-blog of the Glenn Beck rally, I noted that the yellow "don't tread on me" flag had become the nofficial icon of the Tea Party movement. Back in late August I blogged the massive Glenn Beck rally of Tea Party supporters. 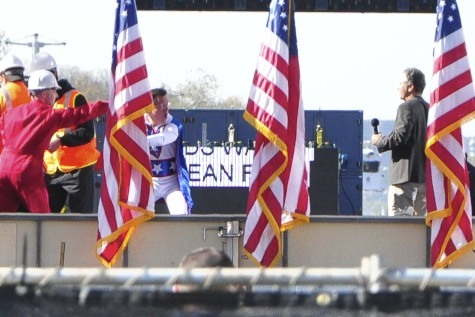 Today, Americans who perceive characters like Sarah Palin and Glenn Beck as more of a problem than a solution participated in a rally of their own. 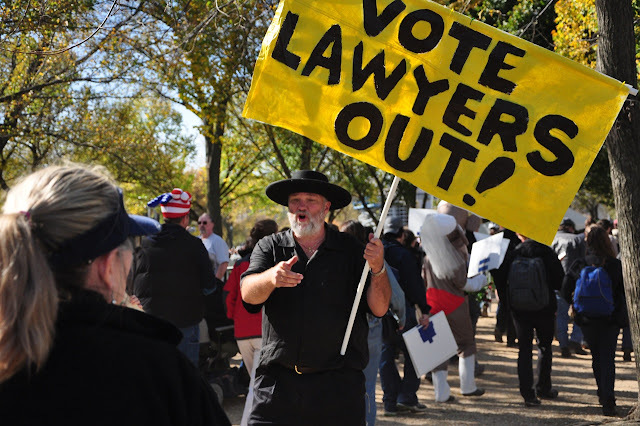 By the tens of thousands they gathered on the Mall in Washington D.C. on Saturday, heeding a call by Viacom-owned Comedy Central's Jon Stewart and Stephen Colbert to "Restore Sanity and/or Fear." Jotman was there. Although the rally was not scheduled to start until noon, by 10:00am the capital's subway system was jammed to the extent that it was futile to try to board a train at many stations. The sidewalks of the streets leading to the mall were crowded with rally-goers. The scene on the streets resembled inauguration day two years ago. 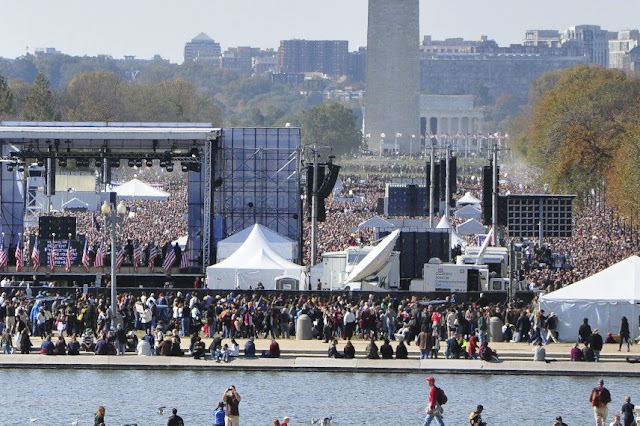 But unlike inauguration, the planners of this rally had not thought to set up a sufficient number of big screen televisions. Far more people were arriving than rally organizers had thought to accommodate. To make matters worse, the park rangers had closed off grassy areas of the mall adjacent to the area in front of the stage, forcing tens thousands of people to crowd the walkways. The message Code Pink took to the rally was "restore sanity: end the war." Promoting the rally on his show, Jon Stewart had seemed to equate this colorful anti-war activist group with the extremist politics of the right. 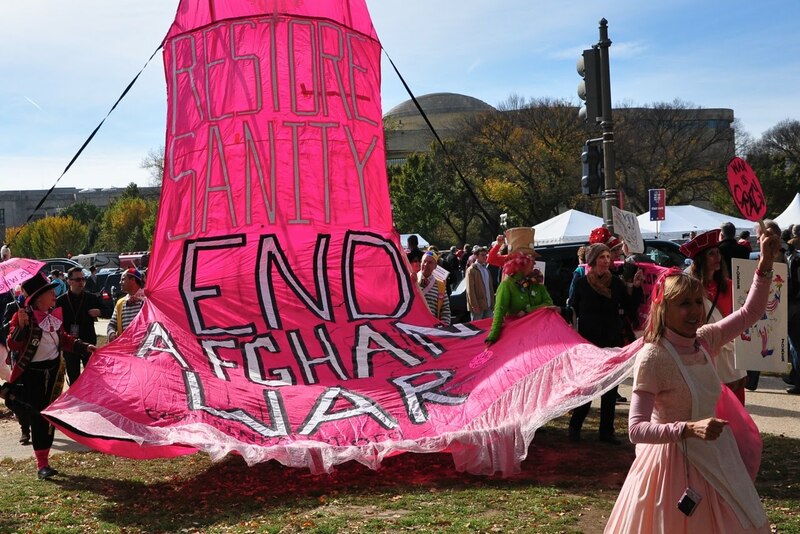 This was Code Pink's answer to Jon Stewart. A question that the Tea Party has yet to answer: Why now? 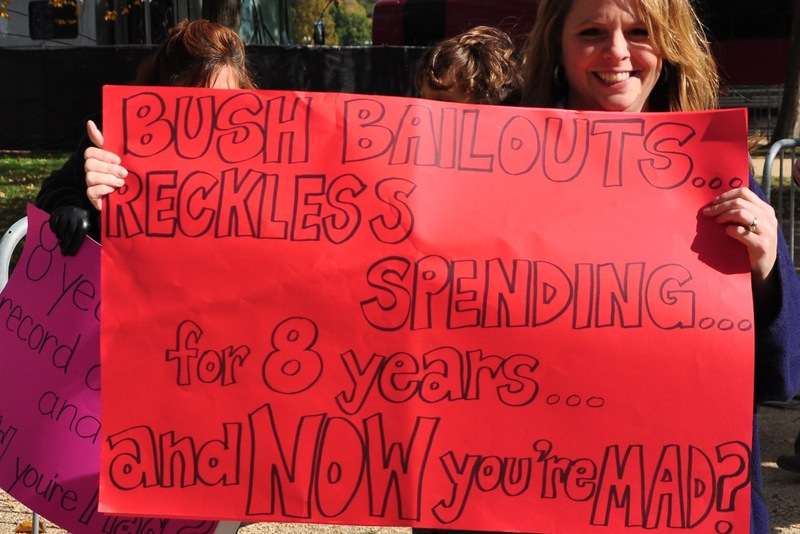 Where were you when George W. Bush was driving up the deficit, giving away the store to corrupt Wall Street bankers? 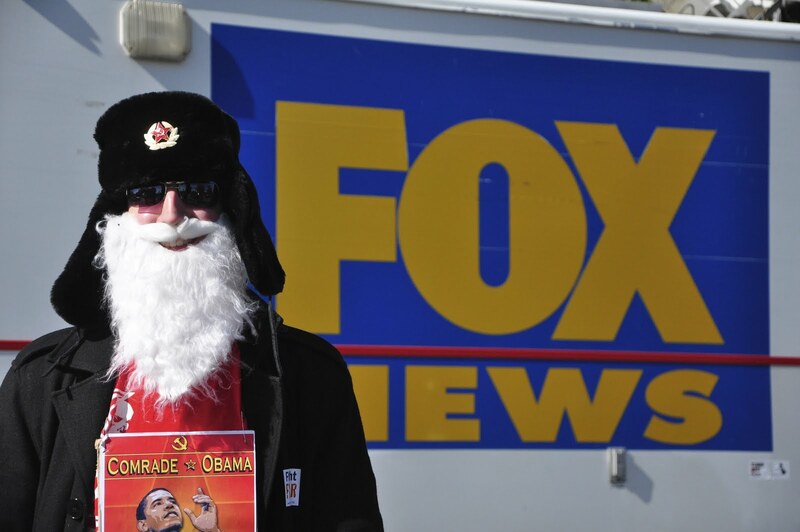 Typical Obama supporter according to Fox News. Fox News sent a van to the rally. I saw that Fox News had parked its van behind a heavily armored military vehicle occupied by a SWAT team. I thought there was a particularly heavy police presence at this rally. It seemed to me that the police did not have nearly such a visible presence at previous rallies. 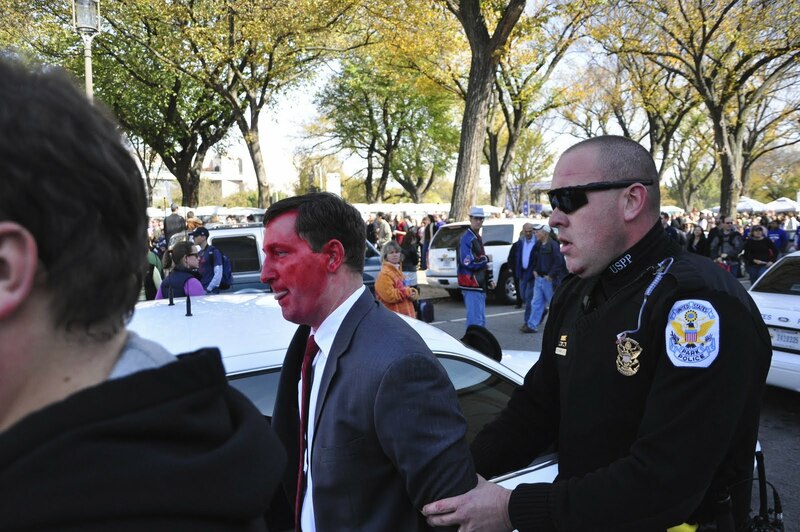 Apparently, this man was arrested for having crossed a fence. When I saw a man in handcuffs being led to a police vehicle, I asked the fellow why he was being arrested. "I crossed a fence," he said. "But I have no idea what I am being charged with," he added. Hearing the man's comment, a passer by exclaimed, "For crossing a fence! Oh come on!" There were many fences surrounding a rally site that was far too small to accommodate a truly massive crowd. 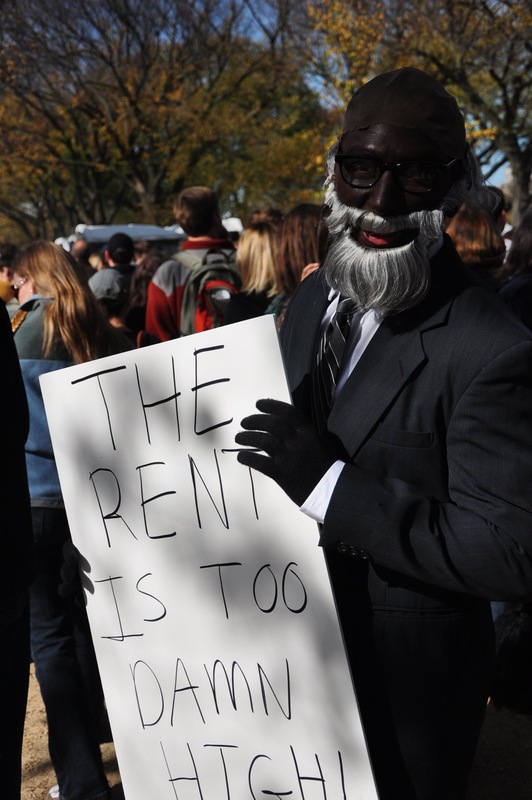 The rally from Capitol Hill. CBS News estimates that the crowd numbered 215,000. Stephan Colbert (left) and Jon Stewart (right). I was standing far behind the stage when I took the above photo with a telephoto lens. Stephen Colbert had just arrived. Note the massive teleprompter in the background. They have come to save America. Not sure who these people were, but there were lots of them, and they seemed to be having a good time. Unemployed Man attended the rally. 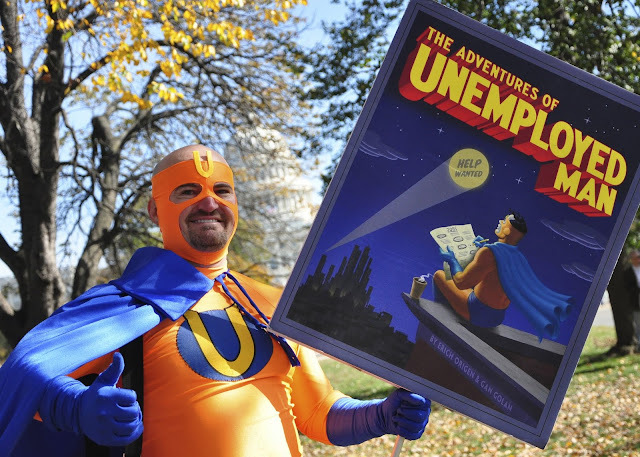 Unemployed Man is a cartoonist who has begun to get a lot of media attention. He has authored a book.